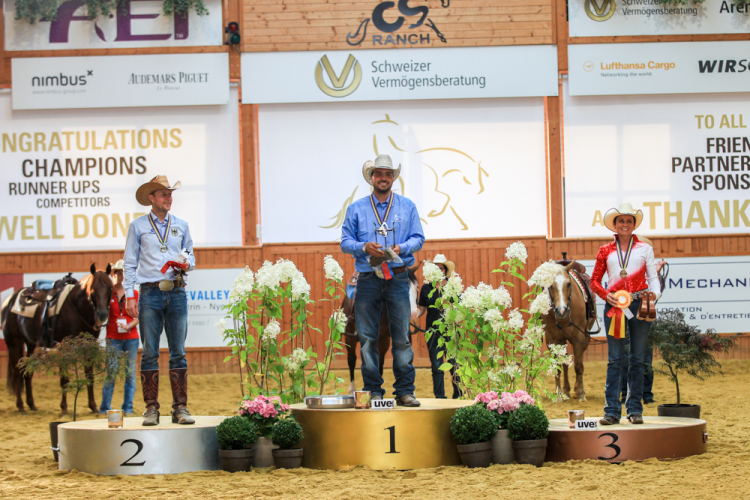 Riders from the United States, Austria, Belgium, France, Italy, Germany and Canada hit the field in 21 combinations as Gennaro Lendi and Yankee Gun took the individual gold medal. Lendi’s performance ended with Itay winning the gold medal for the individual competition with a 222. Lendi has been a part of the FEI World Reining Championships since the very beginning in 2008 when the event was held in Manerbio, Italy. The event featured just 16 nations at the time. Lendi was a part of team Italy, which won gold against the United States. He also won the bronze medal in individual competition. Lendi also performed at the 2014 World Equestrian Games. Yankee Gun, a 7-year-old stallion was Lendi’s companion on the field. Yankee Gun is an AQHA and APHA horse that Lendi took over a year ago. Yankee Gun was trained by Shawn Flarida, a prominent figure in horse training, before he was given to Lendi. Yankee Gun is an intelligent horse, and Lendi claims he had to spend a lot of time getting to know the horse before teaching him how to compete. Lendi praises Yankee Gun for always wanting to give more than what is asked of him, and Lendi concentrated on bonding with the horse to get him ready for competition. Lendi claims that Yankee Gun is very sensitive to his surroundings and environment, and prior to his performance, his horse didn’t perform well. He worked with his horse during the two training sessions that he had with the team and during individual competitions. Filippo Masi, Italy’s team coach, claims that Lendi made up for his run in the team competition, which was not up to the coach’s expectations. A lead penalty hurt team Italy’s team competition, of which Lendi was the anchor rider. FEI features the world’s finest riders. With a full house, excitement filled the arena as Lendi was able to best the 221.5 posted by Tina Kuenstner-Mantl of Austria with a 222 score. Tina was the third to run, matched by Germany’s Ludwig and Gwhiz Im Smart. The two posted a 221.5 score and went on to win the silver. Lendi’s gold medal was secure, but Tina Kuenstner-Mantl and her 9-year-old Quarter Horse had to partake in a run-off to determine who would take home the silver and bronze medals. She performed to 212.5, a score that Ludwig was able to best. Ludwig performed a clean, precise run knowing that he could easily best the 212.5 performance. His performance scored a 217.5, bringing home a silver medal at the World Championships for Germany. Italy’s Paolo Fabbri started the day off at 14:00h on Lenas Drawin His Gun. The middle of the second drag time started an early trend at the competition, with Italy’s Pierluigi Chioldo scoring 216. His score lasted for only a few minutes before Germany’s Alexander Ripper and his nine-year-old study, Hollys Electricspark, knocked Chioldo out of the lead with a 218.5 score. Belgium shocked the crowd, grabbing the gold on the very last run. The Senior Riders Team Competition was exciting, with Germany’s Ludwig scoring 221 to push Germany’s total to 660. The score secured Germany as the silver medalist, but there was the option that Germany could potentially win gold. Bernard Fonck was the only rider left, and as the current NRHA World Ranking leader, he was nothing short of sensational. His run with his 8-year-old stud ended the day with a 222 score, helping Belgium win the gold over Germany by just 1.5 points in the very last minute of the event. Prior Belgium’s win, the team competition was up-for-grabs. Germany’s Dominik Reminder and his horse, GR Hug A Jewel, ran a 220.5 to push Germany back into the top ranking at 656.5, ahead of Italy which had 652.5. The USA came in third with 640 points. Austria had a 639.5 score, right behind the USA, before Belgium’s Cira Baeck and Bernard Fonck posted phenomenal performances. Barck scored 220 followed by Fonck posting a 222 to help Belgium, which wasn’t on the radar, win the team competition. Fonck was also in the running in the individuals, posting a 219, unable to beat Lendi’s score. Ann Fonck scored a 220, with Cira Baeck riding to a 220.5. We would like to thank everyone that helps to make the World Reining Championships possible. From the FEI to the horse air tranpsort companies and grooms looking after the horses on a daily basis. Without our sponsors this event wouldn’t be possible without all of your help. We look forward to seeing you all at next years World Reining Championship. If you are in need of equestrian show coats, be sure to see check out the latest collection from Animo. Attending the Winter Equestrian Festival? Need a rental equestrian proper or looking for horse farms for sale Wellington, Fl contact Laas Equestrian Real Estate. Completion of the World Equestrian Center is due to be complete in 2021 and now is the perfect opportunity to buy horse farms for sale in Ocala, FL. Ocala Horse Farms has a variety of properties to choose from.